This phrase made famous by the Verizon pitchman, now Sprint spokesman, was a genius way for Verizon to make consumers aware of their frustration with poor cell service. Today, technology may make being heard better, but we have yet to figure out how to be better listeners. Last night I went to see The Hitman’s Bodyguard with Samuel L. Jackson and Ryan Reynolds. (Hilarious, by the way). I pick my theatre by their food selection. The Regal in Opry Mills serves really good fried cheese sticks with marinara sauce. I need more than popcorn and candy to make me happy during a movie. I am that guy who gets to the theatre thirty minutes early, so I am not rushing in as the previews start. I want to make sure I stake my claim to a middle-of-the-row seat about three quarters of the way up. The young man working the counter greeted me with a warm smile and great attitude. “I’ll take an order of fried cheese sticks, a small Coke - fill the cup halfway with ice - and a small, plain popcorn,” I replied. The ensuing interaction was a scene out of an old Three Stooges film. “So you want butter on that popcorn?” he inquired. “Butter or no butter?” he asked. “Plain. No butter. Nothing but popcorn in a bag,” I said with a bit of frustration in my voice. “What type of soda would you like?” he asked. Ugh! I thought I told him Coke. Every day I purposefully try to communicate what I need to avoid confusion and frustration, like telling my lunch waiter my drink choice while requesting cocktail napkins to keep my workspace dry. He wrote it all down, and still no napkins. It’s impossible to find people that actually “listen”! I promise you this frustration is not limited to Michael Attias. Chances are your employees aren’t listening either. If your server misses something, they can go in the back and get it. If a catering client asks for something and it is not delivered, you have bigger problems. Earlier this year I brought on a new Business Development Rep. His primary responsibility is to put inbound and outbound leads through a Sales Tempo and set demo meetings for me. Part of my ongoing responsibility to him is development. Every week I listen to recorded calls he has made. They are excellent coaching opportunities. A few weeks ago I identified he wasn’t listening to his prospects. We have all been there. We are so focused on what we will say next that we don’t take the time to really listen to our prospect. For a prospect that is maddening. I am the easiest guy to sell to. I will tell you exactly what I want. That few seconds gives you time to respond intelligently as an active listener. Now most of us ADD business owners think coaching is a “one and done” thing. Actually, it takes seven to ten times to get a point across. Are Your Employees Listening to Prospects? It’s our job to continuously monitor and coach our people up. Are you recording your catering calls? Restaurant Catering Systems has a built-in phone system that records incoming and outgoing calls. The purpose is not “got you”. It is to offer constructive criticism. You want to help your employees identify their areas of opportunity and correct them. Not only does our software include a call module, we've also written a handy guide to help your employees improve their telephone skills, and win more catering clients. I have always believed the largest opportunity in any business is how the phones are handled. 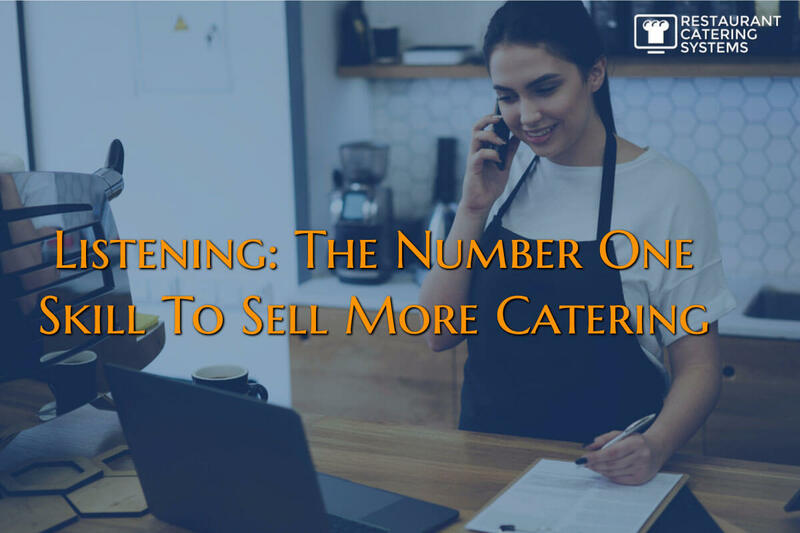 Often, the bulk of catering revenue is derived via phone. Shouldn’t you monitor how the calls are being handled? A Google search will identify more tips to becoming a better listener. Incorporate them into your training; initial and ongoing. When a customer feels you are listening, you are rewarded with loyalty. To learn more about our call module, click here to schedule a demo of our system, or click here to take a Free 30-Day Software Trial. To your restaurant's marketing & catering success!